Malrod has been providing specialist services to industrial and commercial properties in the field of asbestos removal, encapsulation and management since 1975. Established at a time when asbestos was first being recognised as hazardous towards health, Malrod has been uniquely placed to advance in time with the increased standards of sophistication in the equipment and personal training fields required in modern day asbestos removal. As a company Malrod has always taken a professional view of what is a legally complex and logistically challenging market. The attitude towards their business niche has meant that today Malrod can offer comprehensive, integrated and expert solutions towards asbestos site surveys, risk assessments, asbestos removal, repairs, disposal and re-instatement. As long standing members of the industry trade association ACAD (Asbestos Control and Abatement Division), Malrod has been at the forefront of the industry for many years, defining internal best practice driving legislative changes to promote a safe and effective working environment for all their valued employees. 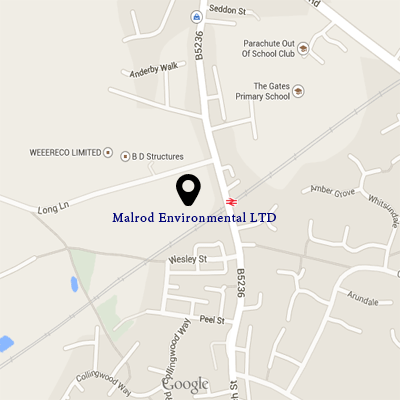 Malrod also operates a Licensed Waste Transfer Station at their Bolton premises, and holds a waste carriers license, all of which are under the strict guidance and audit arrangements of the Environment Agency.